But do you want to venture beyond Handel's masterpiece? Then check out these 10 other great works for Holy Week. The compelling story of the passion, death and resurrection of Christ has been told and retold for centuries. Artists in every genre have put their stamps on the saga, resulting in some of the most striking, gorgeous music in existence, much of it sung. Christians are celebrating Holy Week this week, which traces that story through a series of liturgies (worship services or Masses), each day focusing on one part of the story. Lent, the 40-day season that precedes Easter, is a time of honest reflection and learning. The Triduum (three days) retells the story of the Passion. Maundy Thursday is about the first Holy Communion, ending in the stripping of the altar. Good Friday is about the bearing of the cross and the crucifixion itself. Holy Saturday is a day of quiet reflection on Jesus in the tomb. Easter Sunday, beginning with the Vigil service the night before, celebrates the resurrection. Whatever your own religious experience, sitting with some or all of this music will enrich your spirit. Both the Gesualdo and the Couperin are written for Tenebrae services, in which candles are extinguished one by one, with prescribed readings and music interspersed. The mood is somber, ending in darkness and, in some traditions, concluding with a loud slam (maybe a hymnal on a pew?) that symbolizes the earthquake at the moment of Jesus' death  followed by the relighting of one candle, representing hope. The stark, gleaming perfection of this setting and performance of the story of Christ's passion is like a spear through the heart. Mary at the foot of the cross on which her son hangs  this haunting setting of the 13th-century text captures all the anguish and grief that she must have felt. Jessye Norman: Were You There? The inimitable Jessye Norman uplifts every inch of this well-loved spiritual, sung from the point of view of a witness to the crucifixion of Jesus. This is a sublime setting of Psalm 42, which is sung during the Easter Vigil. Its quiet longing suits the contemplative mood of Holy Saturday: "As the deer pants for streams of water, so my soul longs for you, O God." Jesus refers to his body as a temple that will be destroyed and rebuilt in three days. The story is an allusion to the destruction of the Temple in Jerusalem, which was a body blow to all faithful Jews at that time; spiritually, the Jerusalem Temple was God's home among his people. Practically, the sacking of Jerusalem led to the Babylonian Exile. Jesus uses this reference to let people know that his resurrection will change the story of the faithful, pointing away from suffering, toward hope and oneness with God. That transformation is underway on Holy Saturday, as Jesus lays in the tomb. 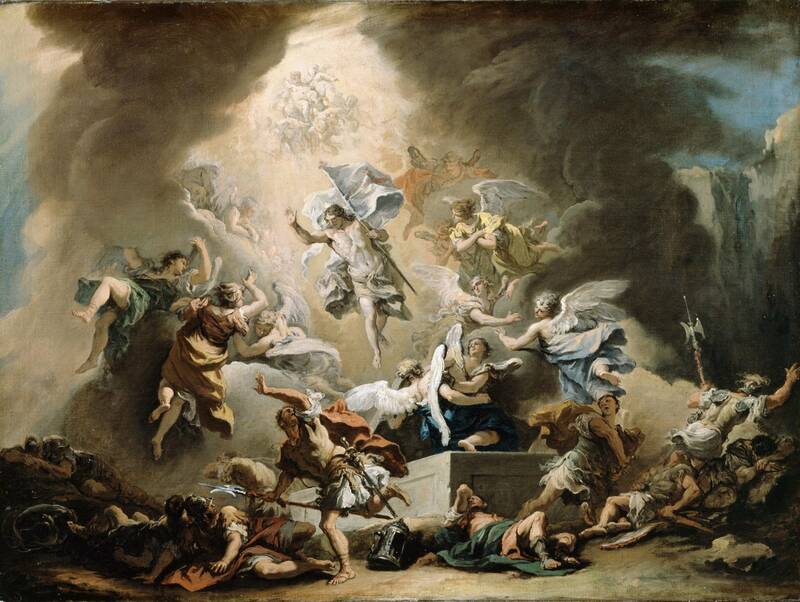 There are biblical allusions built into this piece, but Rimsky-Korsakov's intent was not overtly Christian; rather, he was trying to depict "the legendary and heathen aspect of the holiday, and the transition from the solemnity and mystery of the evening of Passion Saturday to the unbridled pagan-religious celebrations of Easter Sunday morning." Wonderful music! Listen for the themes of destruction in the early movements, pointing toward redemption at the end. Magnificent! And, of course, Bach. Although not as well-known as his St. Matthew and St. John Passions, Bach's oratorio is a glorious celebration of the resurrection.